Just a couple of weeks ago the literary world (and just about anyone who cares about such things) marked what would have been the 100th birthday of the great Roald Dahl. Mr. Dahl, best known for his classic novels like James and the Giant Peach, and Charlie and the Chocolate Factory, possessed one of the greatest story-telling minds of the last century. I have been a fan of Mr. Dahl as long as I can remember and thought I had consumed just about everything he had ever written. However, recently I was delighted to see that there was an untapped font of his writing in the form of letters he wrote to his mother from childhood and beyond. 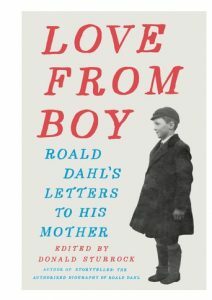 Now, for the first time to mark the centennial of his birth, these letters have been put in the wonderful new book, Love from Boy – Roald Dahl’s Letters to His Mother edited by Donald Sturrock. The letters Mr. Dahl wrote home display his talents in the most intimate way. Unlike the books that have become the favorites of millions, these letters were written for an audience of one, his mother. Yet you can’t help to think that in his signature devilish way he always knew fans like me would one day devour them too. About Love from Boy – Roald Dahl’s Letters to His Mother by Donald Sturrock is available from Amazon and other fine book retailers.